“Ibsen’s Venuses” is a collaborative investigation on Ibsen’s universe between theatre producer Tânia Pires, director Moacyr Góes and women from different cultures and societies in Brazil. The investigations will lead to a new written play with the mission of showing the feminine universe, allowing the breaking of barriers and prejudices, so there is a greater awareness of women on the role it plays in society, besides raising the need for internal personal sustainability of each. The project’s main goal is to encourage women throughout the world to evoke feelings such as courage, confidence and freedom by avoiding prejudice and raising women’s self esteem. The aim of the project is to create a new play that pursues the inspiration and ideas found in Ibsen’s dramas. The project will involve workshops with women of the theatre in other Portuguese speaking countries than Brazil – e.g. Mozambique, Angola, Cape Verde, Portugal – focusing on women’s strength and resources. By combining experiences from different societies and cultures it is hoped that the project will create a production that highlights the relevance of Ibsen’s themes and characters in today’s global society. As written in the project description: “Ibsen’s Venuses” will create a show aimed at developing women’s citizenship, allowing the breaking of barriers and prejudices, so there is a greater awareness of women and the role they play in society, as well as contributing to highlighting individual and personal experiences. The applicant and her company TALU Productions have previously created two critically highly acclaimed Ibsen productions in Brazil – Little Eyolf and The Lady from the Sea, as well as having organized annual theatre festivals – FESTLIP– in Brazil for groups from all the Portuguese speaking countries. The two main participants in the project are Brazilian namely the creator and producer of the project the actress and theatre producer Tânia Pires and director Moacyr Góes. Their work will in cooperation with women from different cultures and societies create the new and contemporary “Ibsen play” which will then be performed in Brazil and other countries. • To draw inspiration from Ibsen’s dramatic work in order to create a play that focuses on women’s capacities. • To introduce young people and particularly women from the theatre to the work of Ibsen and to interact between themselves in order to create new confidence and awareness of their situation and the importance of theatre. • Promote workshops, lectures, debates and stage plays, to provoke reflection, self-awareness of human rights and stop discrimination. • Change and build a more open-minded society for women throughout the world, using theatre and establishing a direct dialogue between the public and the artists. • Popularise Ibsen’s work and use it as a means of transformation. The Jury is particularly impressed with the intercultural aim of the project, and the wish to expand the work of Ibsen in a way that moves beyond adaptation of a single play to the creation of new dramatic practices. Tânia Pires is an actress graduated from Casa de Artes de Laranjeiras (Cal) and Cultural Production, graduated in Social Sciences from Candido Mendes University in Rio de Janeiro and has been working on theatre projects for more than 22 years. Her partnerships include directors such as Moacyr Goes, Zé Celso Martinez, Paulo de Moraes and Sergio Ferrara. She has been curating FESTLIP – PORTUGUESE SPEAKING COUNTRIES THEATRE FESTIVAL since 2008 in Rio de Janeiro with the support of CPLP (Portuguese Speaking Countries Committee). 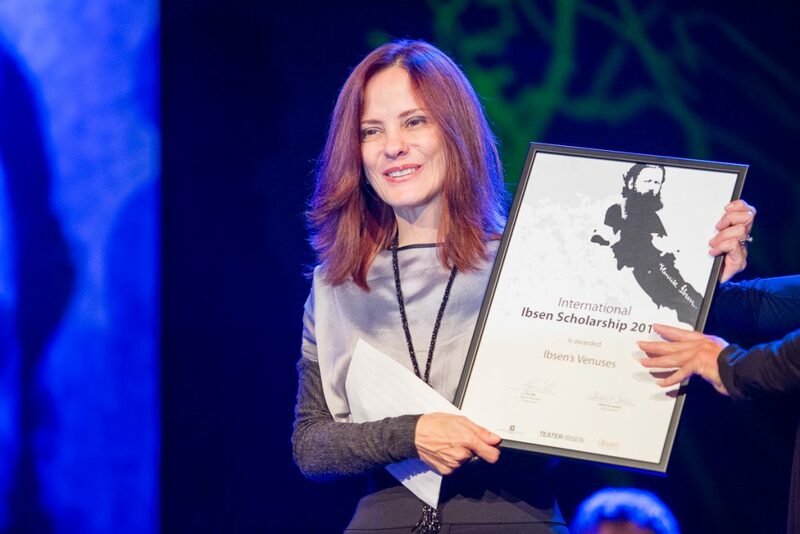 In 2004 she produced and acted in Ibsen’s “The Little Eyolf”, which was, for the first time, selected to represent Brazil in Ibsen Festival in Oslo. She also created the Ibsen Festival in Brazil in 2006 to celebrate his centennial. She works on a variety of projects and productions in the cultural market, such as festivals, shows and exhibitions.